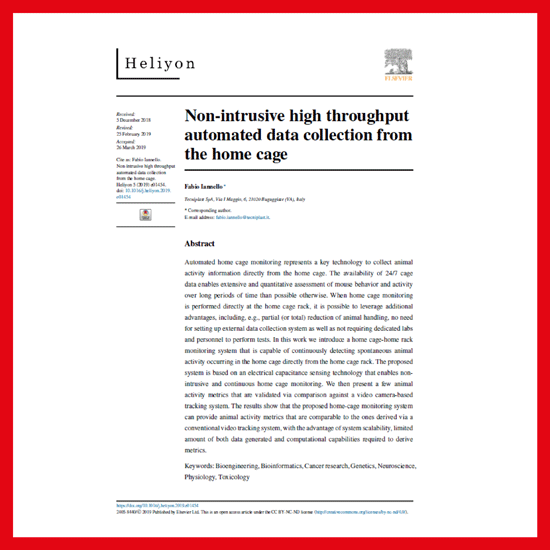 An interesting article titled “Non-Intrusive high throughput automated data collection from the home cage” has been recently published on Heliyon, an open access peer-reviewed journal publishing research across all disciplines, edited by Elsevier. The article validates the DVC® technology and shows that DVC® can provide animal activity metrics that are comparable to the ones derived via a conventional video tracking system, with the advantage of system scalability, limited amount of data generated, and computational capabilities required to derive metrics. The article highlights how automated home cage monitoring represents a key technology to collect animal activity information directly from the home cage. The availability of 24/7 cage data enables extensive and quantitative assessment of mouse behaviour and activity over long periods of time. When home cage monitoring is performed directly at home cage rack level, it is possible to leverage additional advantages, including, e.g., partial (or total) reduction of animal handling, no need for setting up external data collection system as well as not requiring dedicated labs and personnel to perform tests. The article analyses DVC® System, which is based on an electrical capacitance sensing technology, and describes relevant animal activity metrics, such as distance walked, average speed, activation density and occupancy. In addition to this, it proposes a validation approach based on the comparison between DVC® and video technology, so that the same animal subjects are observed simultaneously with both systems. By monitoring capacitance variations over time, the authors have shown that it is possible to measure animal activity and determine location of the mouse within the home cage. The comparisons of the activity metrics considered have been conducted by simultaneously monitoring three individually-housed mice with both DVC® and a camera-based system and assessed in terms of Pearson correlation. High correlations have been found for both distance walked and average speed as well as for front occupation and rear occupation. The authors also introduced a new animal activity metric (activation density), specifically tailored to the capacitance sensing technology proposed in the article. Activation density shows high correlation values when compared against distance computed via video processing and even larger correlation when compared to video activation density. The article emphasizes also that the activation density metric can be generally extended to an arbitrary number of mice grouped in the same home cage, indeed this has been actually already tested successfully in early applications of the DVC® where activity of group-housed mice has been addressed. One of the most important conclusions of the article is related to the fact the DVC® has been designed as a high throughput system that is capable of collecting 24/7 data from potentially thousands of home cages simultaneously (while keeping them on the home cage rack) with very limited network bandwidth and storage requirements, and without needing any human interaction once installed.